As a part of my work with the Callala Beach Progress Association (CBPA) I have recently had the privilege to not only meet Indigenous artist, Noel Wellington, but to also sit with him and have a yarn or two or three! We first met when the (now) president of the association (Trevor Smith) asked me along to chat with Noel about his ideas for a piece at the other end of the shared pathway that connects Callala Beach to Myola. A project the association and its members have worked on over the last few years. Noel had a brilliant idea to place his aquatic and marine life designs onto the pathway seats. His work celebrates the Jerrinja Aboriginal Country who are the Saltwater People of this land and the waterways in this region of Jervis Bay. His artworks demonstrate the cultural diversity, traditions and beliefs of his people. The first piece depicts a pod of dolphins, a strong symbol for the Jerrinja People. 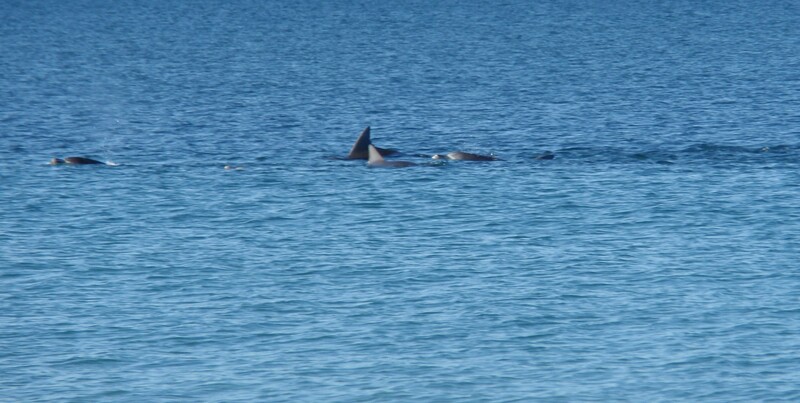 They are also the most famous sea mammal that frequents the shores of Callala Beach and why so many come to visit this place. Noel meticulously plans, carves and burns his designs into the timber, representing Indigenous tree scarring methods. As he works, many locals and tourists stop for a chat. Noel has been very generous with his time, explaining his artwork as well as sharing many stories about his people. 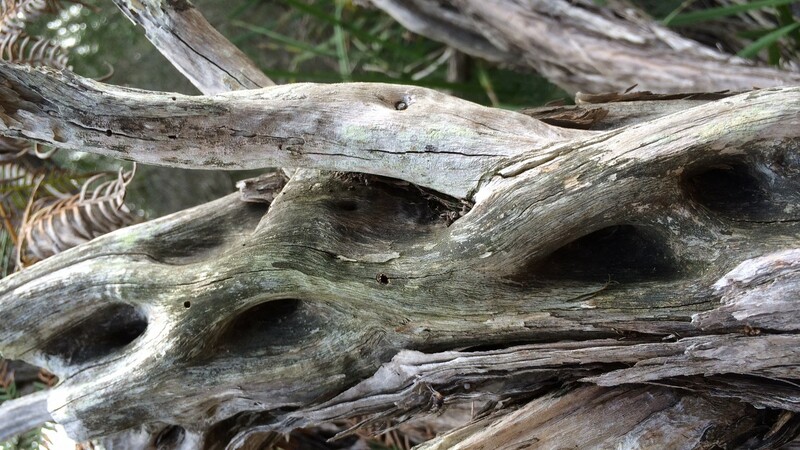 He has been commissioned to do several pieces including eight carved logs at Crookhaven Headland Reserve and two pieces that were acquired by the National Museum of Australia. When Prince Charles and Camilla were invited on a private tour of the museum, Noel’s pieces were selected. Noel himself had the opportunity to chat to Prince Charles about his artwork. The second seat carves the story of when his people waited for the bully mullet to make their migratory journey between the estuaries and rivers along the coast. Sometimes the ‘spotter’ would sit, waiting for three weeks, for the run of fish to make their journey up the coast. When the bully mullet arrived the spotter followed the fish, keeping track of their location, until the fishermen in boats netted the catch. Noel says there was always plenty of fish to share. The third seat is all about the groundfish such as those found in Currambene Creek. These are fish which typically live on or near the bottom e.g. flathead. It has been amazing, watching and listening to people identifying the fish. Noel’s representations are not only extremely beautiful but very accurate. For me, Noel’s artworks are the missing link. The beautiful mosaics that were commissioned (Jill Talbot and Lesley Oliver) at the Callala Beach end of the pathway describe the natural beauty of the area. Along the whole length of the pathway locals and visitors have purchased pavers which are then engraved telling their individual/family’s stories. And so Noel’s carvings tell the story of the original custodians of this land and complete the picture. I can only look forward to seeing the whole pathway and all its yarns. It will be a wonderful asset to the community, to be enjoyed by all that live and visit here. In these last few weeks I have taken a journey along this pathway. I have learned so much about the Jerrinja’s connection to this land that we all feel is incredibly special. I have also shared many laughs with Noel and lots of cake! Recently, Noel asked if I could help him record his story. All I can say is what an honour. It is an important story. It will be an account for his daughter and grandchildren. One that tells of the happy times, growing up as a young child in The Mission at Orient Point. One that recounts the tougher times. And most importantly, a story about being an Elder and a Jerrinja man. He is the custodian of the Lore and the law of his community. He is the keeper of knowledge. And that is something that should never be lost. I would like to thank Noel for sharing his stories with me, with all of us. Recently high seas and rough swells pounded the shores of the east coast. I love walking along Callala Beach, watching and listening, to the fury of the ocean during these times. 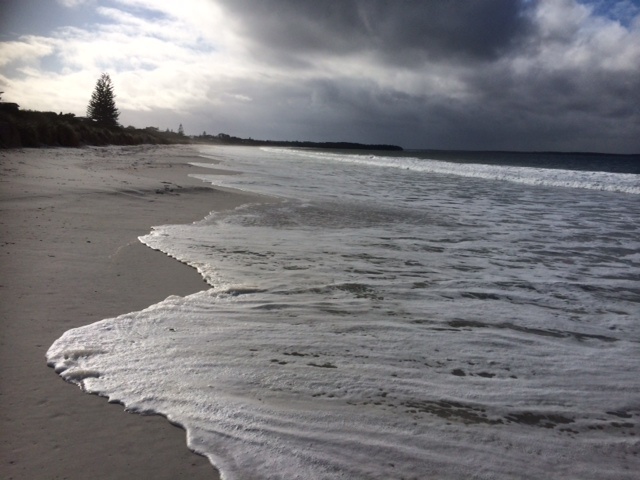 It is such a contrast to the calm lapping waves so often seen in Jervis Bay. The flotsam and jetsam in its aftermath always intrigues as fragments of people’s lives are strewn across the sand. You may have also read a previous post I wrote on the creativeness of locals who put these pieces together to make a ‘Sculpture by the Sea’ on Callala Beach. A poignant reminder of the human carelessness that pollutes our oceans and contributes to The Great Pacific Garbage Patch. Then there was the time huge mountains of red weed were cast upon our shores, piled as high as sand dunes. And Mother Nature revealed more of society’s waste as it struggled with the chore of cleaning the ocean floors. She also magically turned that weed into rich fodder for the fish and bird life. However, I am wondering if anyone else has noticed lemons being washed onto the beach? Each time I see one, I not only think of the expression, ‘When life gives you lemons, make lemonade,’ I wonder where they come from. Have they been carried on the swell for days, weeks or even months? They always look so fresh which makes me think of the recipe for preserved lemons which requires large quantities of salt. Perhaps the salt sustains their vibrant patina. We all know there is nothing like a squeeze of lemon on fresh seafood. Maybe a lemon tree grows somewhere by the sea dropping its fruit, a gift, for those that like to eat their seafood that way. I have never seen apples or onions but once came across a coconut! 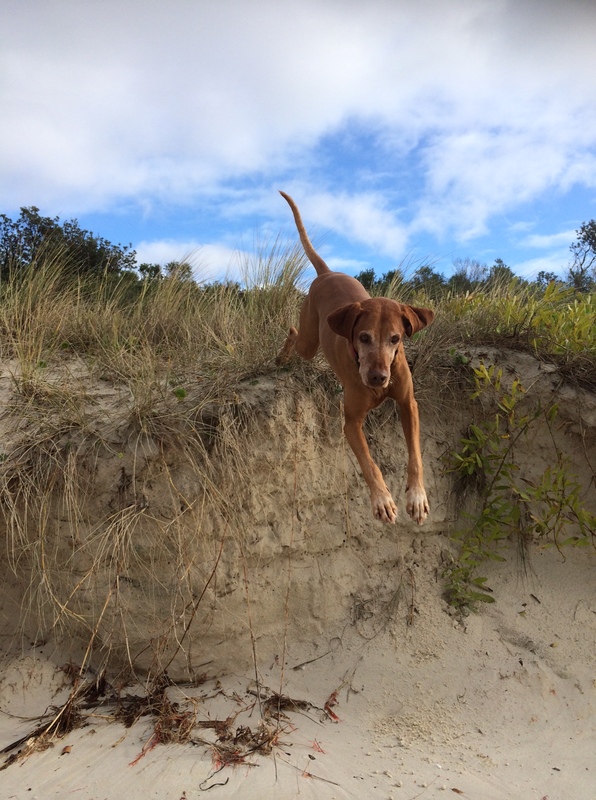 Mali found it an alluring addition to one our beach walks. Coconuts can travel thousands of kilometres in the hope of successful seed dispersal. They are built for these long perilous journeys. Their thick protective shells, layered in hairy husks, provide buoyancy to the fleshy white ‘meat’ inside that is the endosperm. They hope to land on a quiet atoll where crabs won’t gobble them up, moisture is plentiful and the climate just right. So when I see these little lemons lolling in the shallows I think how did they get here and where are they going? They are at the mercy of the wind and the currents, travelling to an unknown destination. Mostly, I think when life gives you lemons stop for a moment and think, how sweet life really is. Recently, I was captivated by an intriguing interview with a colour blind artist named Neil Harbisson. He was born with a condition that means he can only see in black and white. As a result, he has had himself permanently equipped with technology so that he can listen to colour. Yes that’s correct – he can hear colour! Neil’s whole life has been seen in scales of grey and he is the first person to have an antennae permanently bolted to his skull. Neil’s colour sensor device has been described as making him look like a cross between an insect and a call centre worker. He is claimed to be the first cyborg artist. A cyborg is a being with both organic and biomechatronic (biological, mechanical and electronic) parts. Colour emits frequencies and the antennae allows for vibrations to be picked up. This long bendy piece of technology arcs over the top of his head and holds an electronic eye, that lingers just above his own eyes. As it detects colour it sends frequencies to a chip installed into the back of his head and literally vibrates the bone in his skull. As each colour emits a different sound he has had to teach himself which colour is which by holding pieces of coloured card in front of his electronic eye. He learnt his colours just as a young child would. He memorised the names and the notes attached to each of these colours. After some time, Neil didn’t have to think about the notes, and the colours simply became perceptions, which in turn, grew into feelings. He began to have favourite colours. When Neil began to dream in colour, hearing the electronic sounds in his brain while he slept, he knew that the software and his brain had united and he had truly become a cyborg. He is often seen wearing very bright clothing. For example, yellow trousers, a blue t-shirt and pink jacket. How does he decide on what to wear? He looks into his wardrobe and listens to the chords until he finds the tune he likes for that day. If he goes to an art gallery he can listen to a Picasso or a Van Gogh. For Neil, a trip to the supermarket is like going to a nightclub. Each product vies for his attention, especially the cleaning aisle, creating voracious pieces of music. So as spring takes its hold and pushes aside the greys of winter, I wonder what Neil would think about the colours of Jervis Bay and its surrounds. The widest blue sky, reflected in the aqua water, flanked by the whitest of sand. 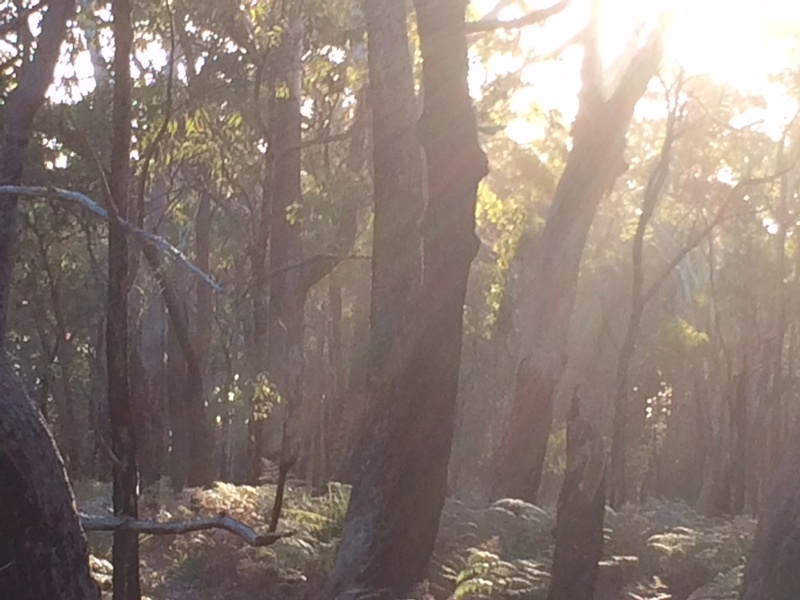 To walk through the bushland around Callala Beach, brushing past blades of green. 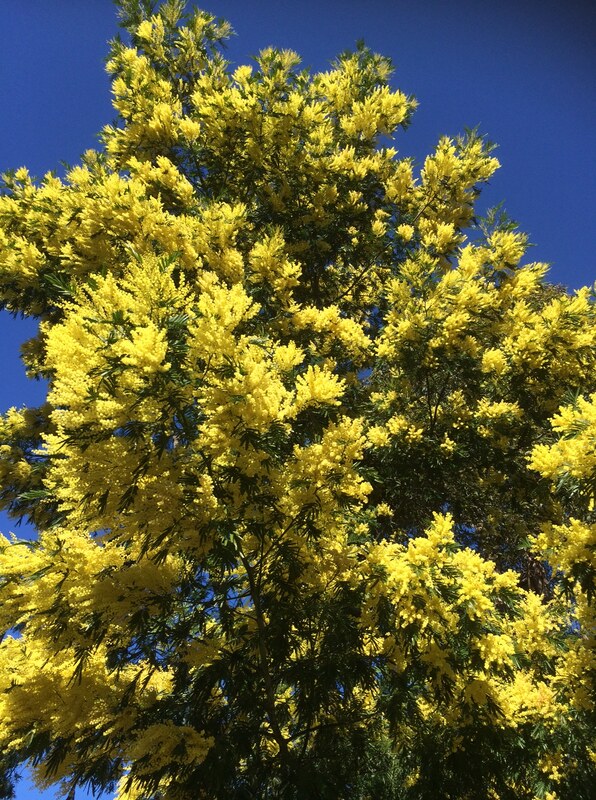 To come upon a wall of wattle that whispers the hopes of Summer. 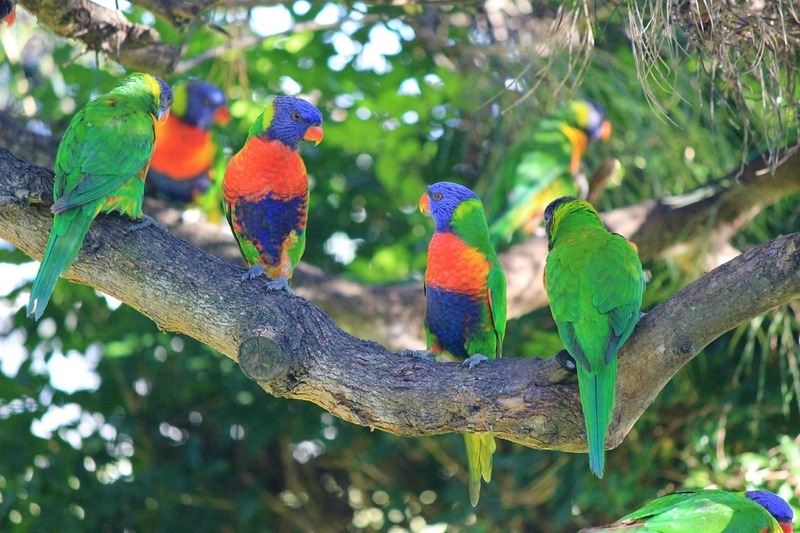 To look up at the eucalypts and hear the vibrancy of lorikeets, king parrots and rosellas. Their feathered sounds competing with their boisterous calls. To rise early and wander along the length of the beach, watching the sun rise. The colours of nature bring such a wonderful feeling of gratification and pleasure. Neil can now enjoy this in his own unique way. I admire how he is so content with having the gift of being able to sense colour through sound. I can only wonder how the melodies of a Jervis Bay spring would play in his head. In the last week, I have read about two studies that delve into the subject of what makes people happy. The first study involved over thirty thousand participants and was conducted in Canada. It found that people living on streets with numerous trees (more than ten) felt better both mentally and physically than those who didn’t live under a canopy of green. The ‘tree people’ tended to live seven years longer and suffered less health problems such as diabetes, heart disease and obesity. Another benefit of living on a tree-lined street was that it made one feel as though they had received a salary rise of up to twenty thousand dollars! In other words, you will feel rich when there are trees surrounding you that act like huge lungs absorbing not only the carbon dioxide and pollution humans create but all that negative energy that can intrude on one’s life. 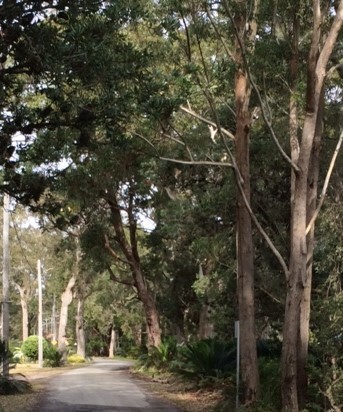 I thought about my street in Myola, lined with immense eucalyptus trees. How I can walk, feeling protected and nurtured, under this shelter of shade on my short journey to Callala Beach. The word ‘eucalyptus’ comes from the combination of two Greek words, meaning well-covered. Surely, all this extra foliage must add years to the lives of my fellow Myolians. Seriously though, one reason why I moved to this area was because the community are a very content and cheerful bunch. Perhaps it has to do with all the trees that surround these towns. The second study, conducted in Melbourne, reported that people who live in towns smaller than one thousand were significantly happier than those in big cities. The combined total of Callala beach and Myola is less than one thousand. Bingo! The reasons for this increased life satisfaction can be numerous. You will never come across a traffic light, and rarely will you see traffic congestion on your drive through Myola or Callala Beach. Crime in cities by far outweighs what you will find in these small towns. In small communities, people look out for one another. They stop, talk and listen. This sense of community is not very forthcoming in large cities. 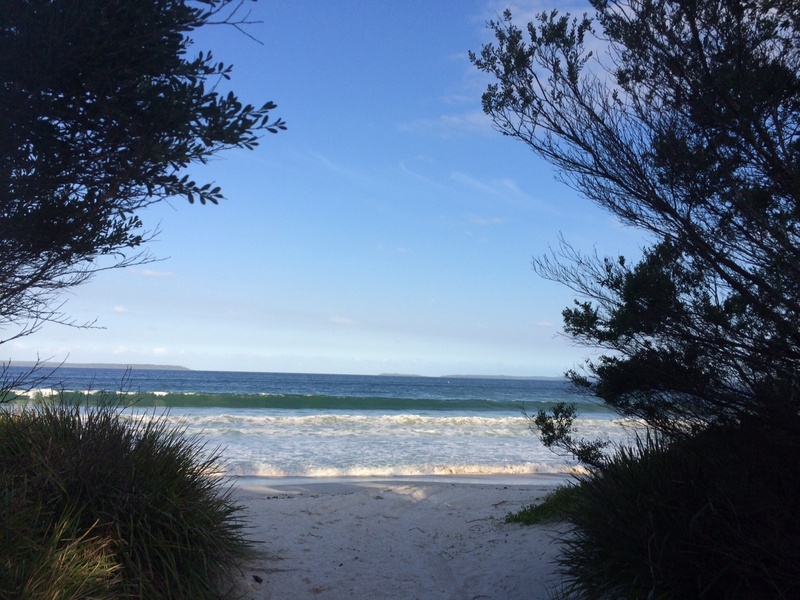 I would like to add another ingredient to this recipe for happiness and that is living on the shores of Jervis Bay. 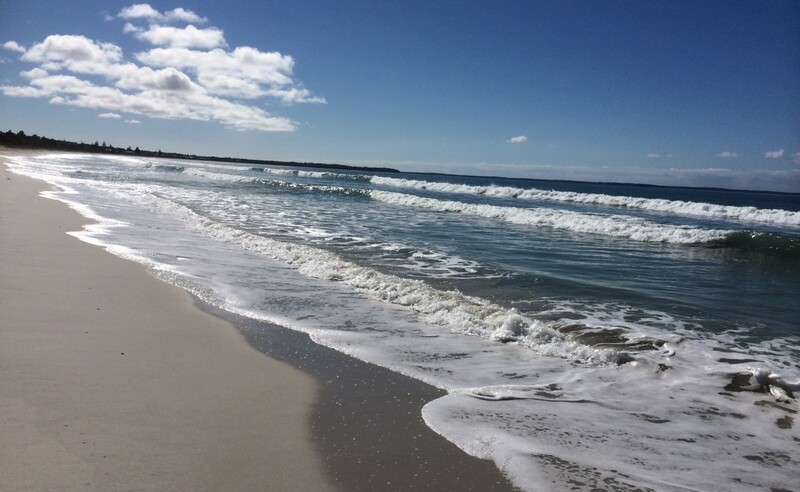 Being able to walk the five kilometre stretch of Callala Beach every day enriches my life. Being able to take my dog on these walks makes it even better. In addition, pet owners are supposed to enjoy a greater sense of well-being. 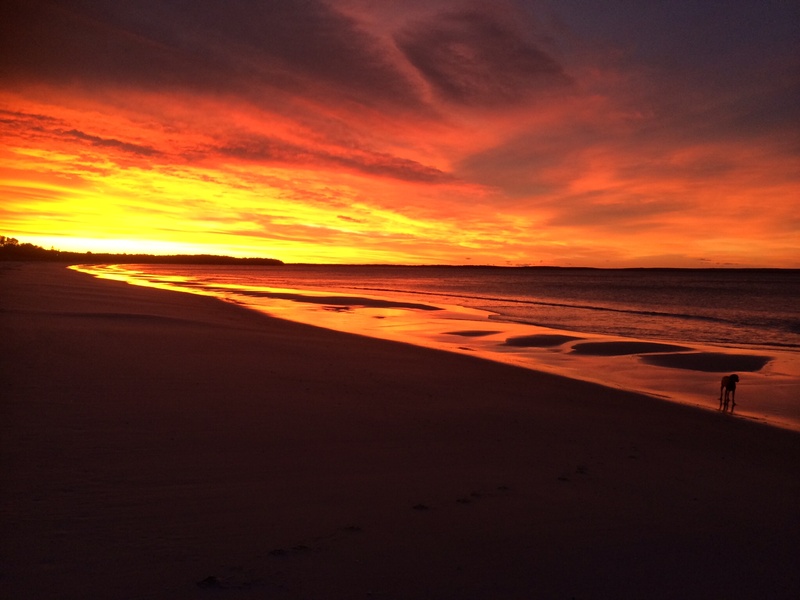 The ‘Happiness Generator’ is on high at Callala Beach no matter what season of the year. Even if it’s a cold Winter’s afternoon, the tide is high and storms have turned the bay into a fierce creature that swells and surges towards the shores. When the frothing tongues of the sea come biting at your feet and you laugh racing towards the higher dunes to escape. When on a Summer’s morning, your breath is taken away because you are forced to turn to the sound of a dolphin’s exhalation. And a pod swims past. 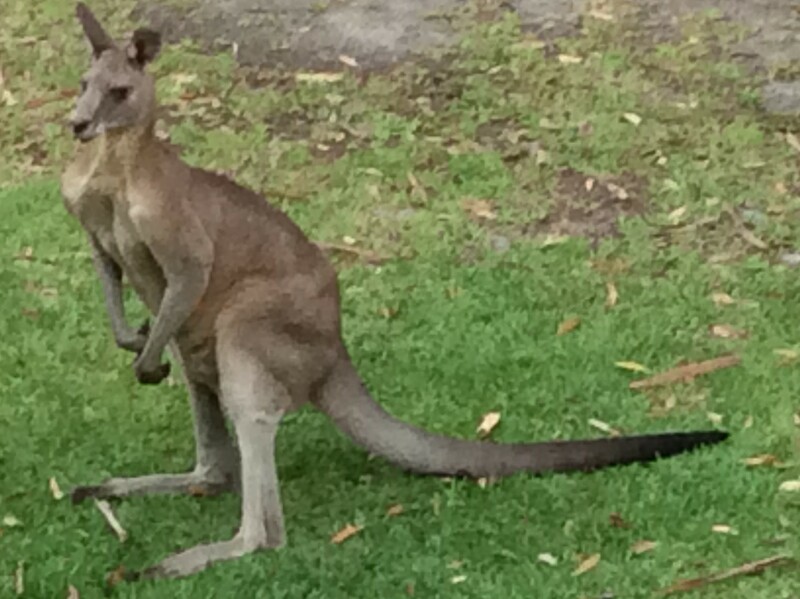 The exhilaration I feel when I step outside the front door and see a kangaroo on the lawn. 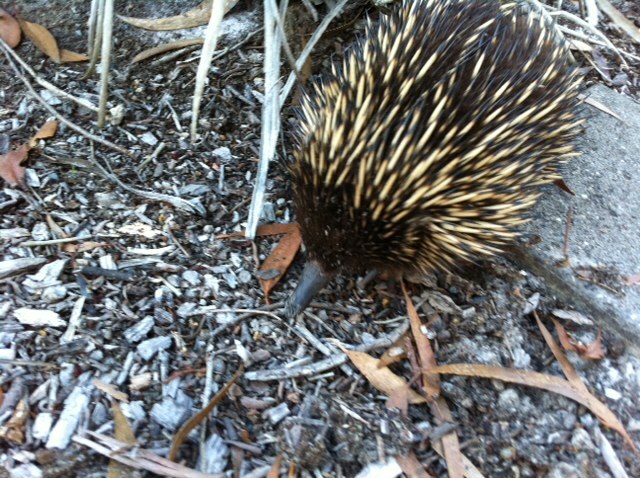 Or if am walking down the street and find an echidna rummaging for ants. In each of these moments, I feel such an extraordinary sense of delight. I feel like I belong to this place. I want to give back twofold what it gives to me. Big hugs to the trees, the nature and the other nine hundred and ninety nine residents in my small beach-side community. Together, we can feel so lucky. So privileged. So grateful. And of course, extremely happy! Like so many others that have come to inhabit the seaside towns of Callala Beach and Myola, I was drawn to the beautiful balance between nature and community. 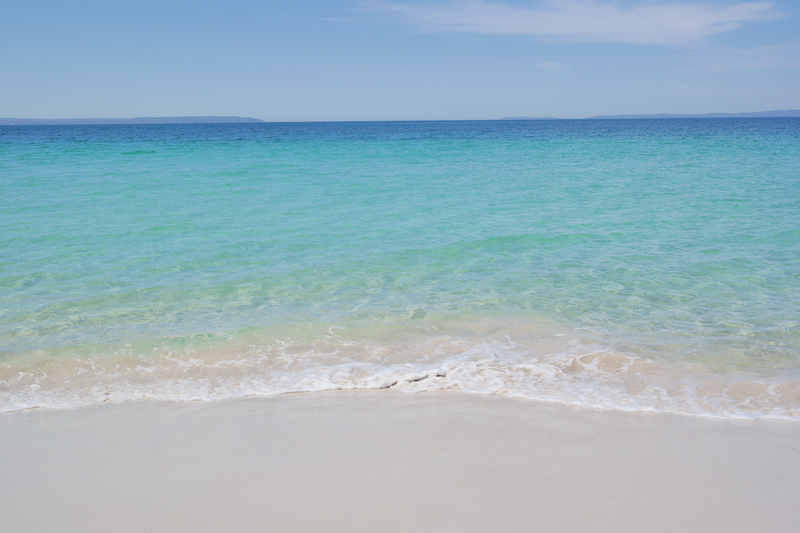 A long stretch of beach with a vista across Jervis Bay. Large sections of beach fringed by bushland. Natural corridors for animals. For those who dwell or frequent this place, a sense of needing to nurture the environment becomes inherent. And this, in turn, generates a sentiment of harmony. 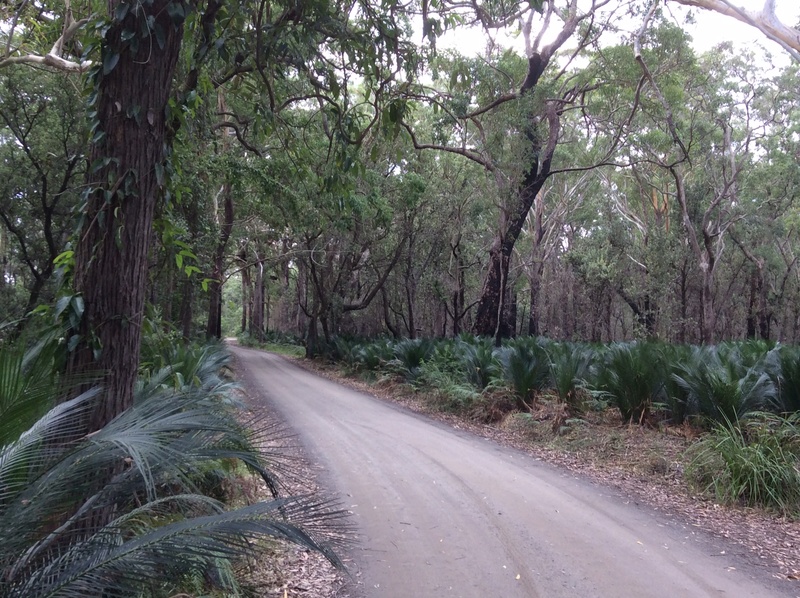 Let me take you for a stroll through Myola, the bush and finally onto Callala Beach. 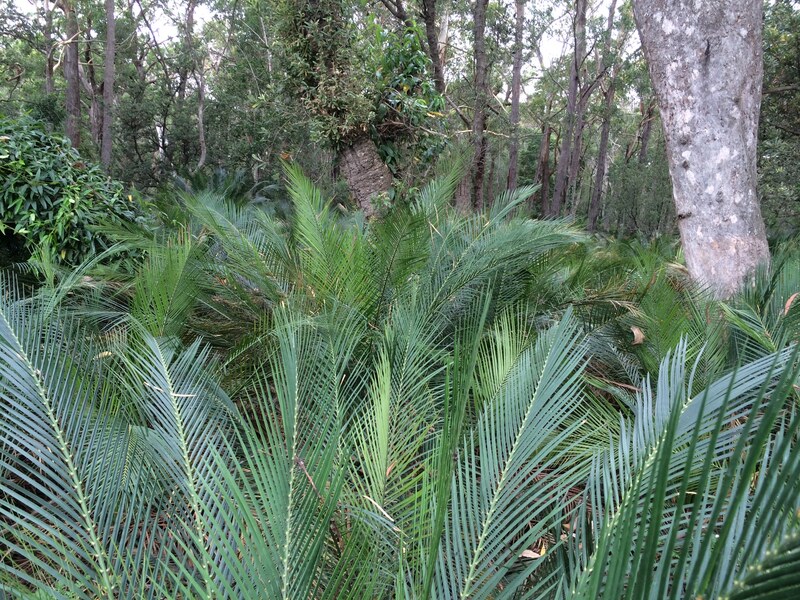 Walking along the northern end of Catherine Street, Myola, an understory of burrawangs line Currambene Creek. 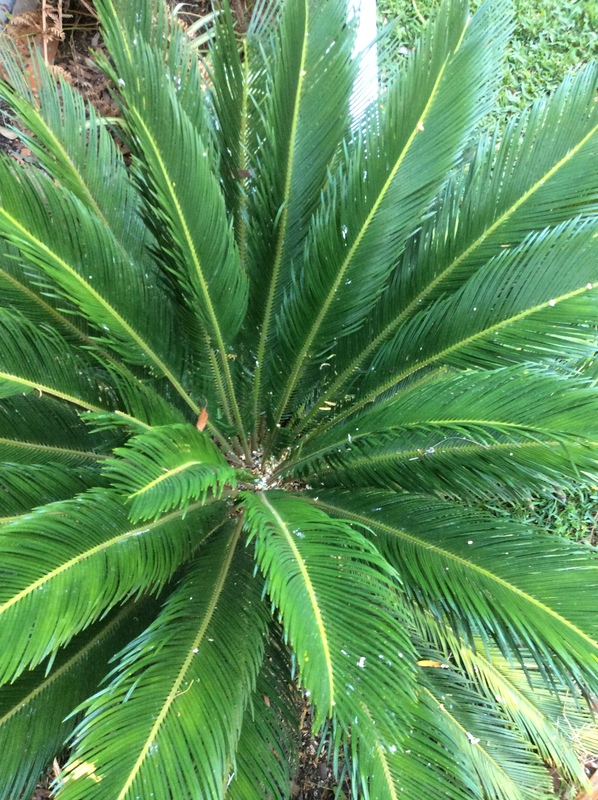 Their spiked form may be why they are one of the oldest living plants on Earth, dating back to the age of the dinosaurs. They are survivors. Long rooted systems search for water and fire makes them multiply. Their wisdom holds the banks of the creek in place, while creating an avenue of antiquity along Catherine Street, up the dirt track, and all the way beyond the boat ramp. 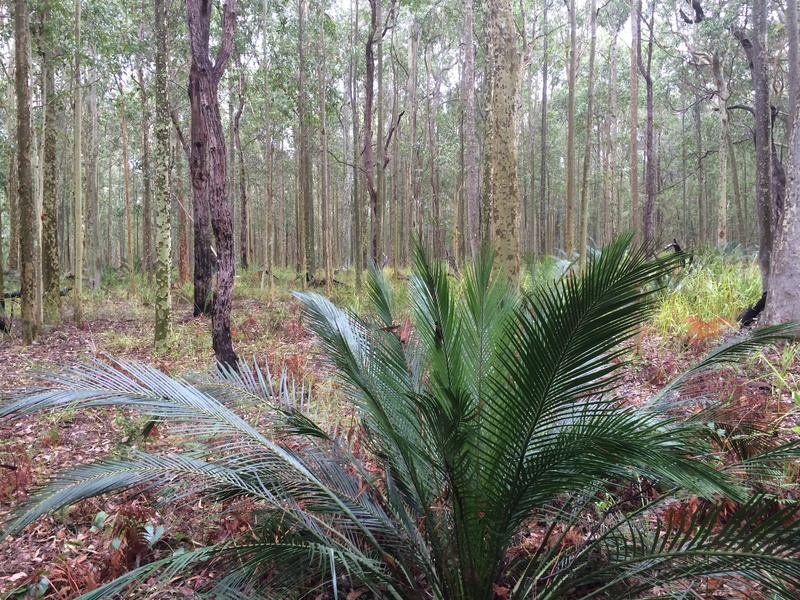 Turning away from the creek, the burrawangs thin out and the eucalypts dominate. 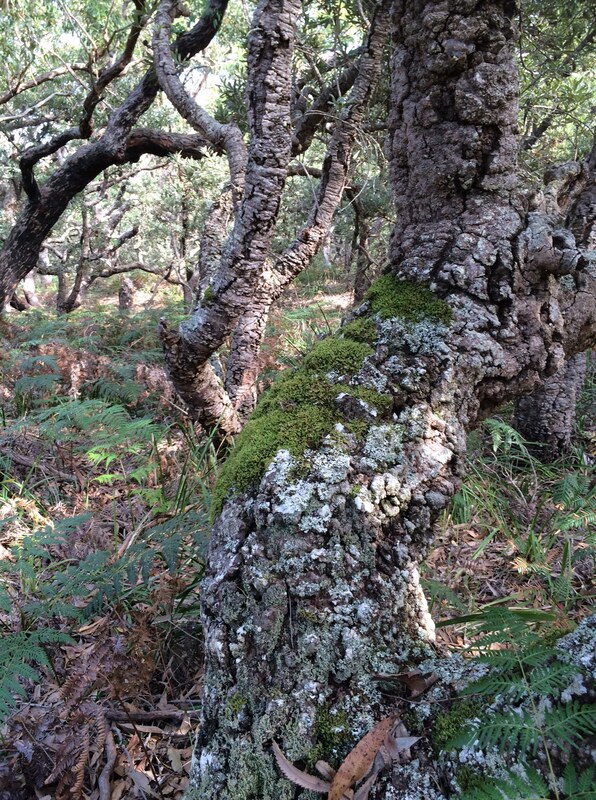 Rough bark, broad trunks. Others are mottled, smooth and straight, reaching for light. A grove of thin saplings among larger satiny hues of greys and greens imply a history of felling. Nobby apple gums with blackened bark expose an age of fires. Strips dangle like ribbons. Elsewhere, bark flakes like crazed paint. Each of these gums has its own timeline, while continuing to add its annual layer of protection. Stories are housed in amongst those branches. Animals and birds have depended upon them. The branches that once brushed against an arm, across a face, now tower above. The bush thickens and the sky becomes less visible. Dappled sunlight filters the track. The voices change. High above gusts shiver through the leaves like a quivering tambourine. The calls of hidden birds create the higher notes. The distant drumming of waves, the percussion. The rich smell of moist humus. An amorphous matter that feeds the forest. Meandering on, heading towards the beach, the path changes to sand underfoot. The endangered Bangalay Sand Forests. Once so many. Now so few. 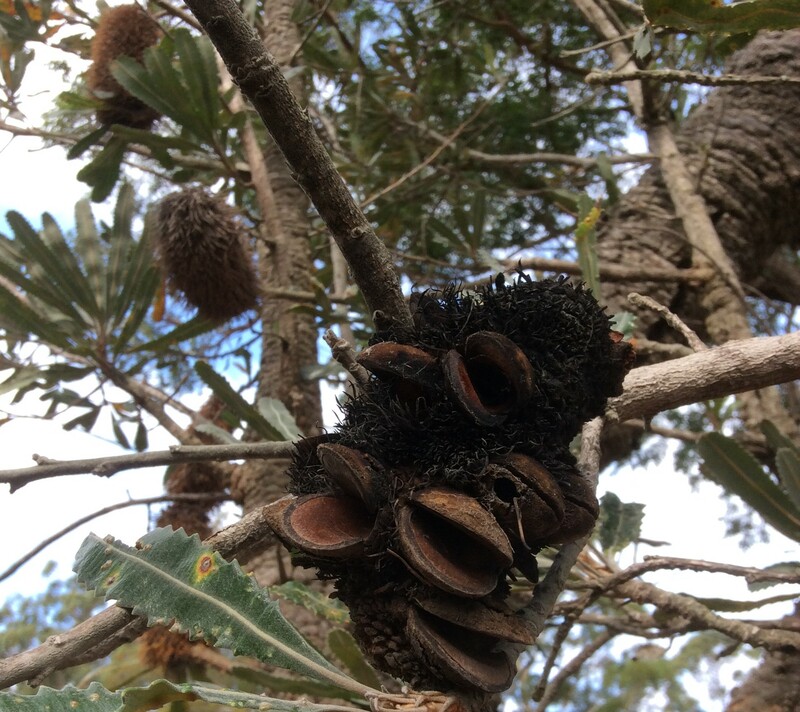 The old man banksias bend in various gnarled and misshapen forms. Serrated silver leaves and woolly seed pods adorn their branches. Little mouths like a hungry clutch of chicks gape at those who pass by. A glossy seedling amongst blades of grasses, a hopeful sign of regeneration. And now as the last undulation is encountered, twisted trunks of tea tree hold the dunes in place. An opening… You have arrived. Point Perpendicular and Bowen Island ahead. Salt spray carried on a southerly. Where ever you look- sand, bush, sea. Ponder the simple beauty of it all. The tiny coastal villages of Callala Bay, Callala Beach and Myola sit side by side on the shores of Jervis Bay. Today, their combined population is approximately three thousand. In amongst those inhabitants dwell some of the most remarkable women I have ever met. These are women of resilience and determination. Qualities that have been forged from adversity. Meeting them has made me consider what matters in life. Dora, Shelley, Fredreka and Bernadette* share common stories. They all came to Jervis Bay when these towns were on the verge of development. A time when few houses dotted the undulating sand forest. A newspaper from that era advertised, ‘magnificent new lots’ for sale from ‘$695 each – $20 deposit – easy terms’. I can’t imagine it would have been too easy. They moved to an area with few residents, jobs were scarce and little infrastructure was in place to carry out day-to-day life. The advertisement described, ‘the crystal clear waters of Jervis Bay must be seen to be believed.’ My conversations with these women have told me that they were all drawn to the bay because of its natural beauty. It was isolated. It was difficult. But it was beautiful. Dora came from Wollongong, Shelley from New Zealand, Fredreka from Germany and Bernadette from Ireland. All felt so incredibly lucky to have found the place called Jervis Bay. Each of these women started their new life on the coast with a husband. However, another common thread shared amongst my fearless four is that they all outlived their partners. They have each lived for three or even four decades on their own. All but Bernadette’s husband died an early death. Bernadette’s story is slightly different in that she refused to return with him to live in Ireland. 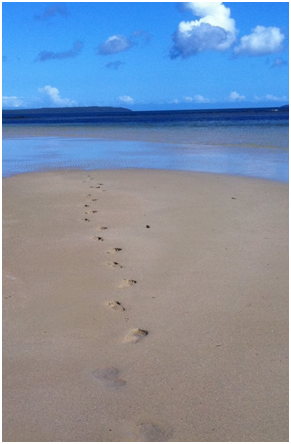 He did not share her love of Jervis Bay and pined for his Irish home. She did not want to leave. She never saw her husband again. And so, all of these women stayed on in the bay. Alone. Did they feel the pain of loneliness? I am sure, at times they must have felt so isolated. But they stayed, impressively independent. Family members tried to lure them back to the cities where there were doctors, hospitals …nursing homes. They declined, feeling like they had all they needed. A modest home. Enough money to pay the bills. Friends. However, they had two other things that held them here. A community and Jervis Bay. The small communities that hug the bay can also huddle and protect their elderly. So for these women, it was not an option: to lose the chance to dip their feet in that splendid water, take a walk along a bush track or a quiet street, listen to the waves and the birds, smell the salty air, be up early to watch the sunrise, have a chat to a friendly face, feel safe. They each felt connected to this place and its people. I am so grateful to have taken the time to stop and be that friendly face that talked to each of these women. I have been allowed to share a little of their lives, to drift through their stories. I have watched their bodies become frail, admired their strength of mind. They fill me with a sense of belonging. And so, I hope that people and places continue to connect so that this community spirit survives. My fearless four endured life during a time when the political and social structure of the world changed. They raised families and cultivated communities in these emerging towns. These women lapped up their days on the shores of Jervis Bay, enjoying the simple things. In hard times, they became buoyant, like driftwood. Aged, worn, but beautiful. They found a way. They did not sink. They survived. They flourished. 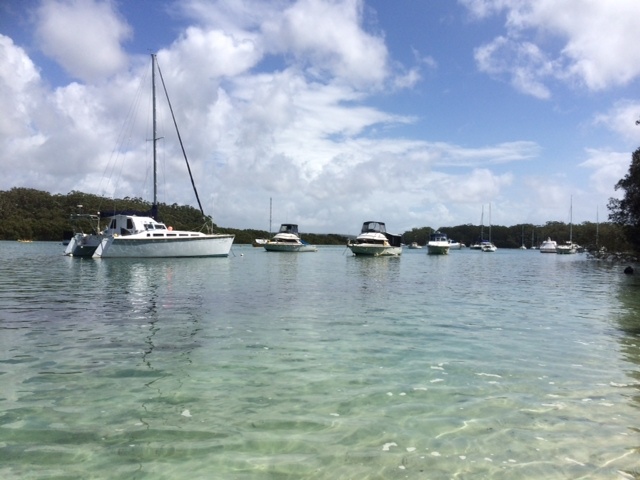 The Currambene Creek is often referred to as a river because of its sandy bottom and wide bends that lead out to Jervis Bay. Each time I journey through its channels on my kayak or walk along its shores, I am greeted by nature’s astounding brilliance. At this very moment, I am looking through the burrawangs, watching the tide flow. An egret is picking its way along the tidal zone on the opposite bank. When the air coils, yacht halyards clang like wind chimes. Traversing this waterway has brought an interesting distraction; the reading of boat names. Not only the names of vessels which are moored along the Currumbene’s channel but those that go past our house on the back of trailers, towards the boat ramp. Many of these are humorous. There is one in particular that does a great job of drawing your attention with its bright green one hundred dollar bills splashed across its hull. It is aptly named, ‘In Debt’! Others that have brought a smile to my face are: ‘Weekend Detention’, ‘No Excuses’, ‘Sassea’ and ‘Angler Management’. Lists of humorous names can be found on the Internet such as: ‘Beeracuda’, ‘Devocean’, ‘Nauti-by-Nature’, ‘Seas the Moment’, ‘A Wave From it All’, ‘Sail La Vie’ and ‘Marlin Monroe’. The naming of boats began thousands of years ago and was based on superstition and fear of the unknown. By naming a boat after one of the great gods it was thought that protection would be given. The ancient Greek sailors would also pray to the sea god Poseidon for a safe journey. The Romans ships often carried two ornate and decorative wooden carvings. On the prow (the forward-most part of a ship’s bow that cuts through the water) was a figurine or figurehead that represented the ship’s name such as a lady, a swan or an eagle. On the back of the ship was the tutela. This was the god or talisman that provided protection. The Vikings were also fond of using figureheads on their boats but these were menacing looking dragons that were also believed to give protection. Christians named their boats after saints so that the sailors were kept safe at sea. We have all heard of the famously named ‘Titanic’. The largest moveable manmade object on earth was a show of confidence. In the battle for steamship supremacy, the world was told that it was unsinkable. It came to a crushing end when it hit an iceberg in the Atlantic Ocean on its maiden voyage, over a century ago. The word, titan, comes from Greek mythology. The Titans were a race of giant gods who ruled the Earth until they were overthrown by Zeus and the other gods. The Titanic symbolised strength and power but perhaps the human hubris (self confidence and extreme pride) offended the ancient Greek gods who often punished those with such a trait. Boats have traditionally been ‘christened’ with the use of alcohol. This again harks back to ancient times when wine was poured over the vessel as an offering to the gods. Another tradition is to give boats a female name. Even if a boat has a masculine name, it is usually referred to as a ‘she’. Some theories suggest that many boats were named after goddesses. Others say that sailors found comfort in a female name as they depended on the boat for life just as a child may depend on its mother. The sailors were cradled and protected by the ship. Or perhaps it goes back to the captain’s love for his ship. Contemporary explanations are not so kind. For example: It takes a lot of paint to keep her looking good; It’s not her initial expense, it is her upkeep or When coming into town, she always heads for the buoys. So the next time you are travelling on or near a waterway, keep an eye out for the names of the boats rocking on the current and remember Poseidon may just be lurking beneath the surface, keeping an eye on them too!